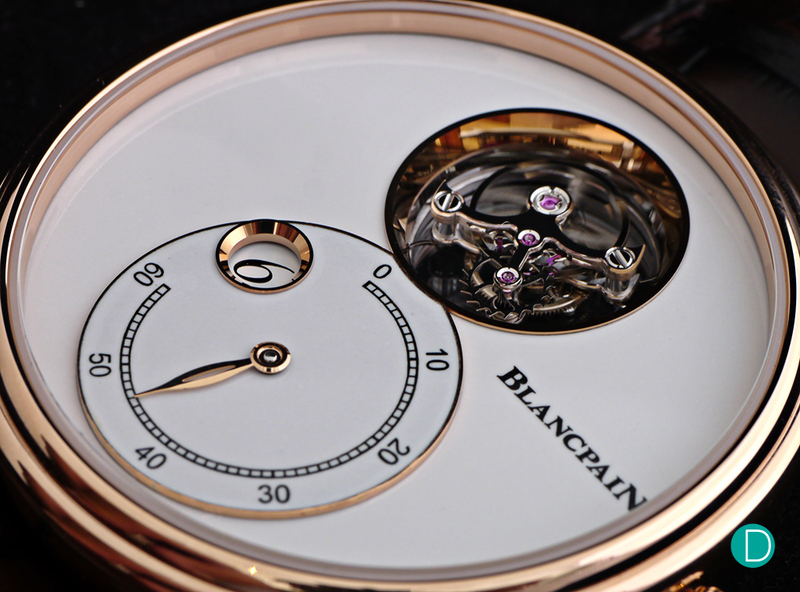 Almost 30 years ago, Blancpain broke new ground by equipping a flying tourbillon in a wristwatch, an industry first. 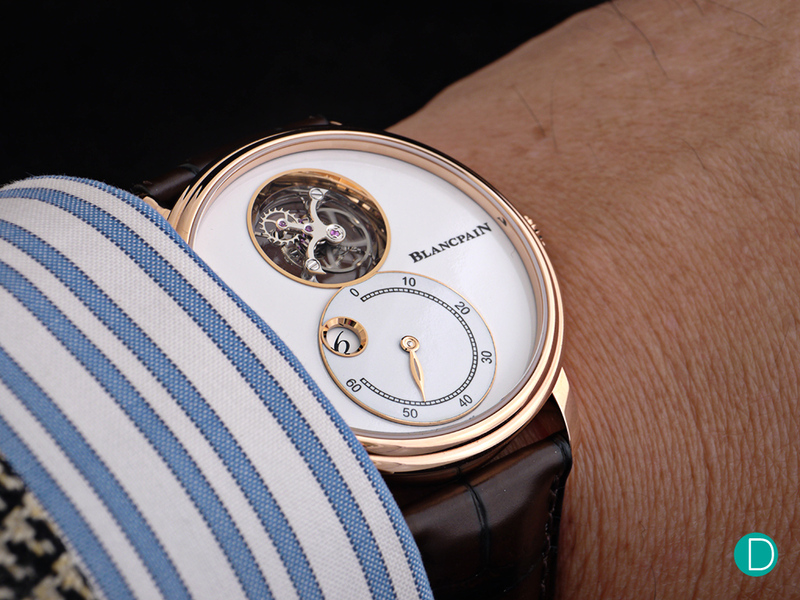 The precision device has since been an integral part of Blancpain’s collections. This year, the brand has not only introduced a novelty that would feature the flying tourbillon, but one that would also see them embark on not one, but two “firsts”. For neither the jump hour nor the retrograde minute mechanisms have ever appeared in a Blancpain wristwatch. Going by the definition that a complication refers to any indication in a mechanical timepiece beyond the hours, minutes and seconds, it would be fair to say that this may be the most sophisticated timepiece in Blancpain’s catalogue that hasn’t got a single complication. Well, sort of, but more on that later. Here, we bring you the details and our thoughts on the new Villeret Tourbillon Volant Heuere Sautante Minute Rétrograde. The Villeret Tourbillon Volant Heuere Sautante Minute Rétrograde is housed in a delightfully nuanced, double-stepped 42 mm case. At 11 mm in height, the watch isn’t thin but should still slip under a dress cuff with ease. Entirely polished from front to back and from lug to lug, the case exudes an air class and elegance. 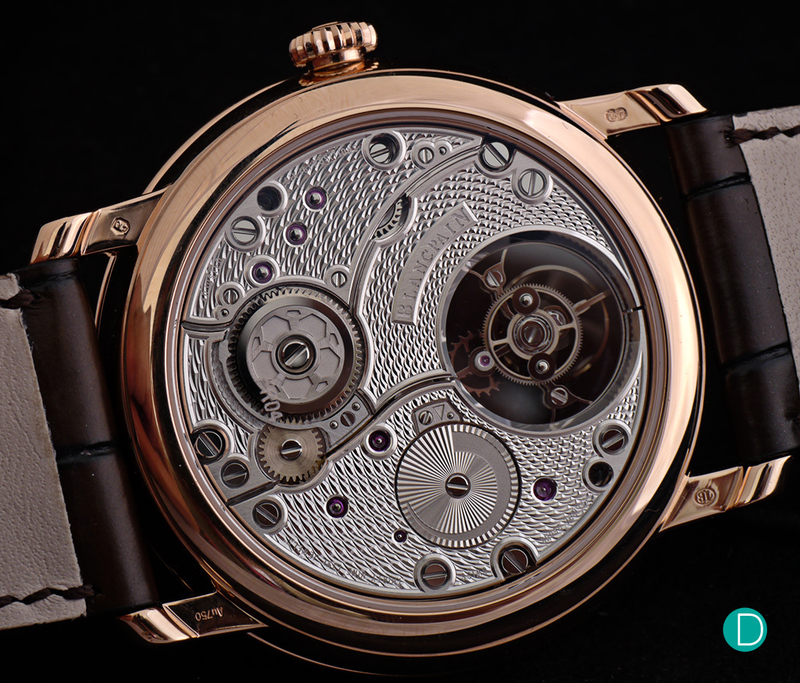 The two steps on the case form a slope, making it easy for the watch to slide under a dress cuff. Matching the sensuous case is the equally evocative dial. 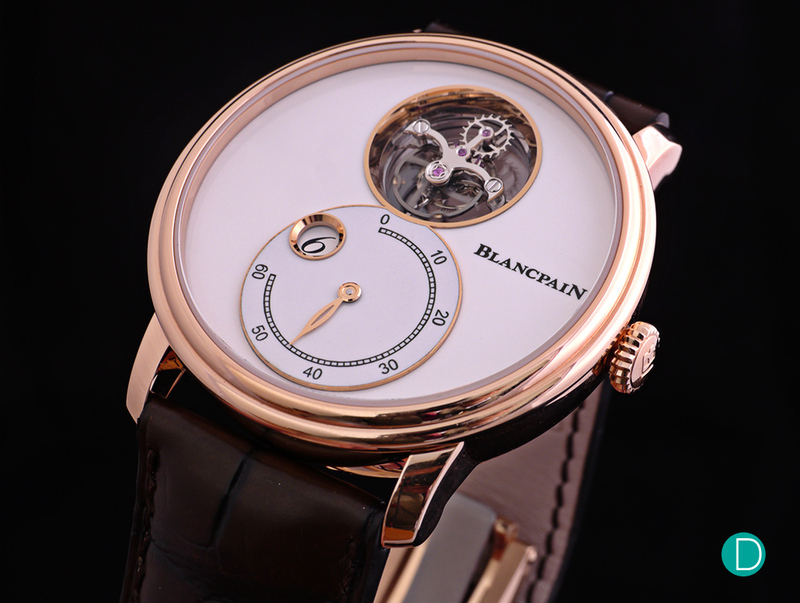 The pristine grand feu enamel that graces the dial is crafted at Blancpain’s Le Brassus Métiers d’Art studio. Artisans begin by hollowing out the solid gold base of the dial to create small compartments – learned enthusiasts will recognise that this is the first step to champlevé enamelling. Several layers of enamel are then hand-painted onto the dial and fired at temperatures of around 800 degrees Celsius (hence ‘grand feu‘). The result is a lustrous enamel dial, prized by collectors and connoisseurs alike. An aperture at 12 o’clock provides a break from the pearliness of the dial and houses the comparatively animated flying tourbillon. The flying tourbillon hasn’t just got the upper bridge removed, but also the lower bridge, which is replaced by a clear sapphire disk. As a result, the tourbillon appears to be floating in space – a truly impressive sight. Under it are the minute and hour displays – the co-stars of the dial – which are grouped together, with the hour window placed on the retrograde minute counter. While the hours are displayed by means of a jumping numeral disc, the retrograde minutes are indicated by a skeletonised leaf hand that resembles a needle head. The tourbillon aperture, hour window and minute counter are individually encircled by diamond-polished gold rings, heightening the sense of depth on the dial. A stunning close up of the flying tourbillon, with a cage that has been black polished to an incredible sheen. The non-traditional design of the dial is bound to attract critics and fans alike. The pedants among us might be concerned about the amount of negative space on the dial; the positioning of the three circles; or the fact that the company marquee, the numerals on the hour and minute displays, and the “Swiss Made” inscription (not seen on the photos due to angling) all utilise different fonts. For what it’s worth, we feel that the overall unique design of the Villeret Tourbillon Volant Heuere Sautante Minute Rétrograde is fantastic and that the design team has done a great job. The dial design is clean and classy, though some may find it a bit sterile. Powering the Villeret Tourbillon Volant Heuere Sautante Minute Rétrograde is the 263-part, 39-jewel Calibre 260 MR. The movement, like all others by the brand, is made in-house. The watch is manually wound, and like its name, its power reserve is long, providing 144 hours of autonomy. While earlier on we introduced the Villeret Tourbillon Volant Heuere Sautante Minute Rétrograde as a watch sans complications, this technically isn’t accurate. A close examination of the back of the watch would reveal a sunburst hand guillochéd wheel that indicates the power reserve. It helps the owner keep track of the remaining power of the watch, which is especially crucial when said watch has an atypically long power reserve. In the grand scheme of the timepiece, the power reserve indicator isn’t nearly as interesting a feature as the tourbillon, jump hour or retrograde minute. This is probably why it has been placed at the back, so as to not disrupt the cohesive design and theme of the dial in front. 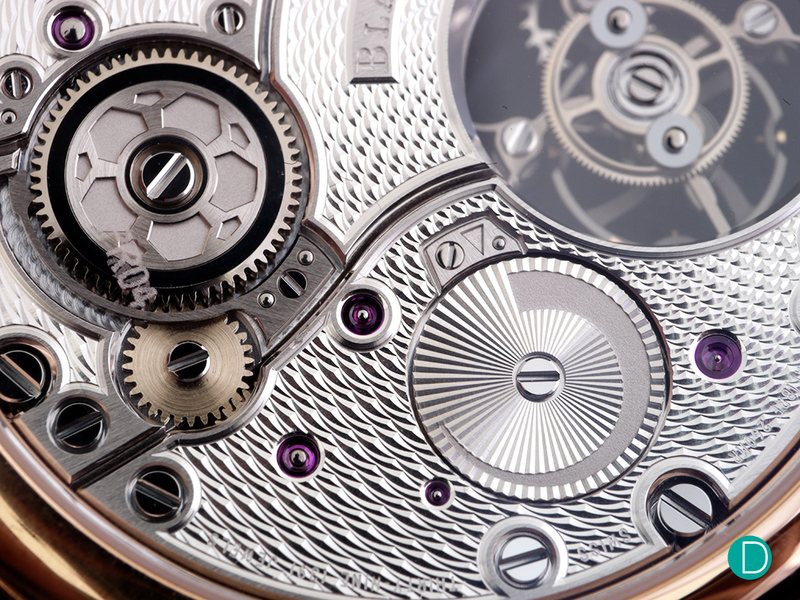 The Calibre 260 MR, seen through the sapphire crystal case back, is as much a work of art as the dial in front. The finishing and decoration on the Calibre 260 MR is just as mesmerising as its floating regulator. Instead of the usual Côtes de Genève, the bridges on the Calibre 260 MR are adorned with an intricate, wave-like, hand-guilloché pattern. Outlining these bridges are raised edges with straight grained surfaces and polished bevels. Plenty of outward as well as inward angles can be found on these edges, which is absolutely praiseworthy given that they cannot be made by machine (especially the latter) and that they require utmost skill to form by hand. This is precisely why many mainstream high-end brands today shy away from them; they believe it isn’t worth it and that they can get away with it (Narrator: they can’t) with rounded angles. Also of note is the ratchet wheel, which features the brand’s famous beveled wheel-rim design. Suffice to say that Blancpain has more than made up for covering up the majority of the movement because what’s been done to the surface is truly breathtaking. 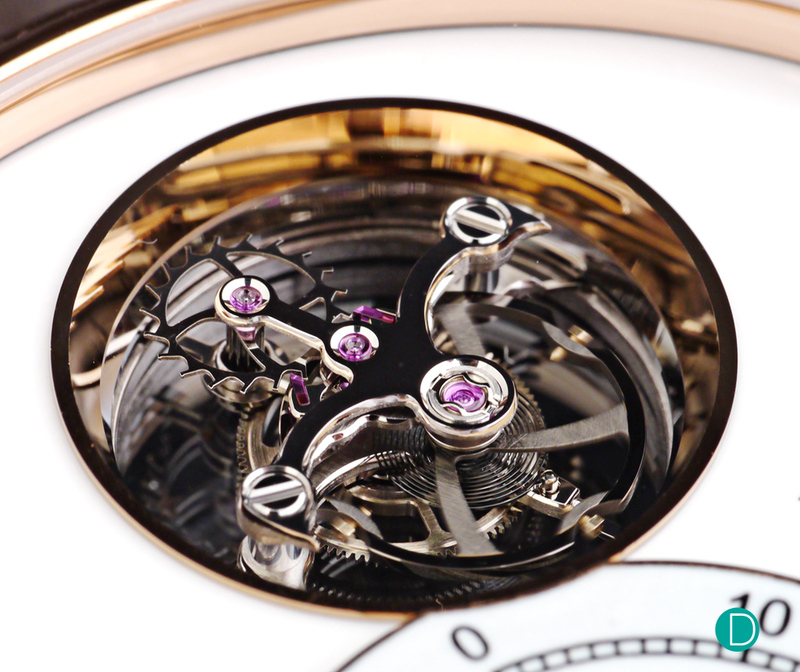 A close up view of the movement reveals gorgeous decorative details. With its unique design, aesthetics, and set of features, one can expect that few watches if any at all directly compete with the Villeret Tourbillon Volant Heuere Sautante Minute Rétrograde. And with a reasonable price tag (for the market today) of SGD207,000 or CHF139,000 for the rose gold variant (a 20-piece limited edition platinum version is available too), you’d be crazy not to at least consider Blancpain’s latest Villeret piece over other watches in the same price range. The Villeret Tourbillon Volant Heuere Sautante Minute Rétrograde is available in rose gold or platinum, the latter being a 20-piece limited edition. Nevertheless, the fact remains that the design of the watch understandably may not be everyone’s cup of tea – it is quite contemporary after all. Fortunately, there are worthy alternatives out there. 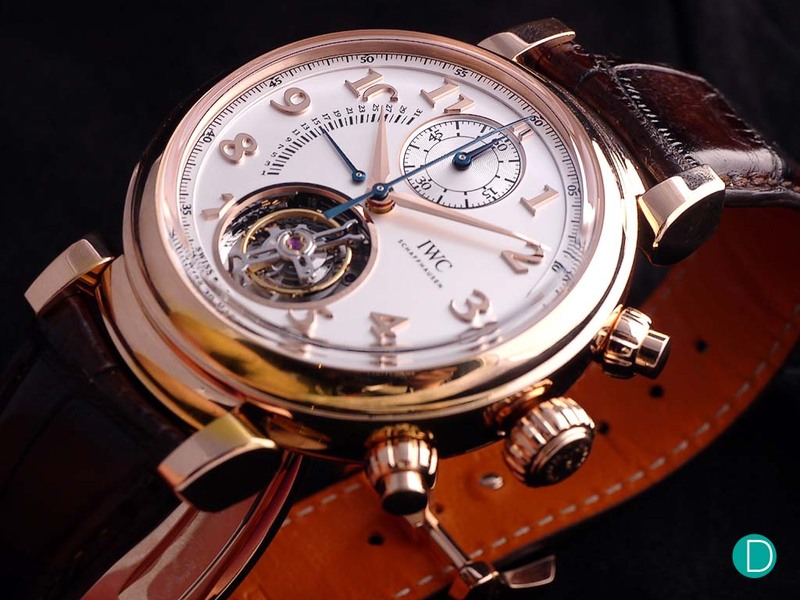 One example is the IWC Da Vinci Tourbillon Retrograde Chronograph. Much like the Blancpain, the IWC has a flying tourbillon. Though much less impressive than when applied to the minutes, the IWC also has a retrograde function for its date display. This is as far as similarities between the two watches go, as the Da Vinci Tourbillon Retrograde Chronograph is, well, a chronograph timepiece, and an automatic one at that. 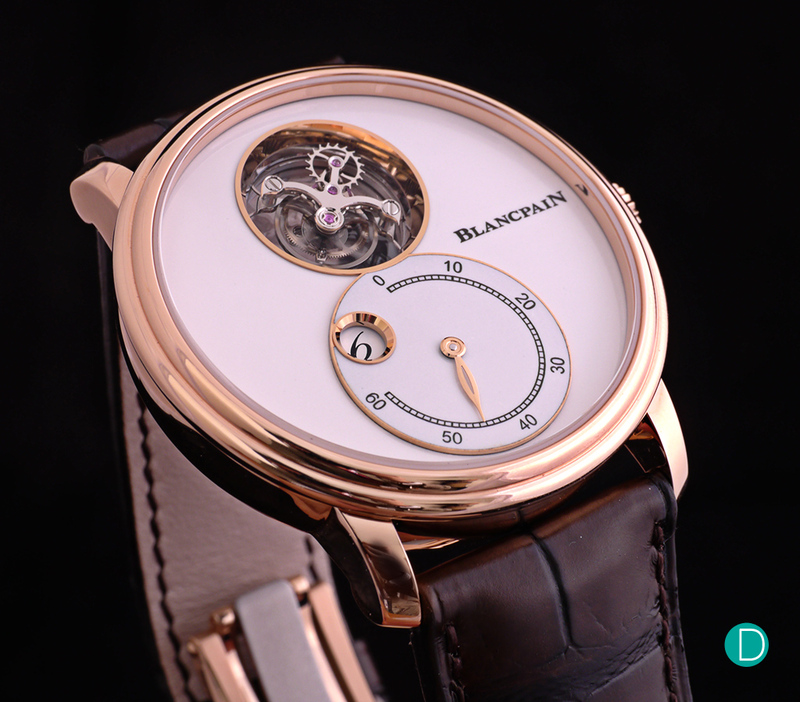 While it is much more functional, its 44 mm diameter makes it less wearable for most people than the Blancpain. 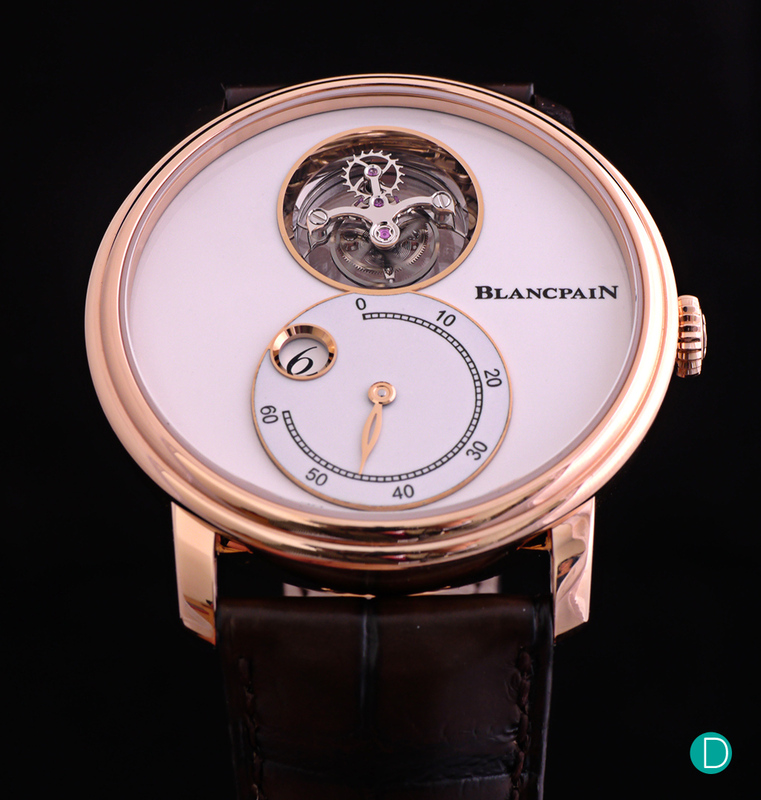 From a finishing standpoint, it is obvious that the Blancpain would come out on top. Priced at SGD156,000, the IWC is about 25% less expensive compared to the Blancpain, which feels just about right. Those preferring added functionality and impartial towards fancy finishing and decoration would feel right at home with the IWC Da Vinci Tourbillon Retrograde Chronograph and an extra 50 grand to spend on a celebratory Dom Perignon Rose Gold Methuselah. The Da Vinci Tourbillon Retrograde Chronograph, the flagship piece of IWC’s new Da Vinci collection. The timepiece that is perhaps most similar to the Villeret Tourbillon Volant Heuere Sautante Minute Rétrograde is the Ulysse Nardin Grand Deck Marine Tourbillon. It too boasts a flying tourbillon, a retrograde minute display, and a jumping numerals display for the hour. The mechanism for the retrograde minute is much more complex however. The minute hand, crafted from blued aluminium, is made to look like the horizontal spar of the boom of a sailing ship. It sweeps across a translucent arc of blue spinel that extends from 3 o’clock to 9 o’clock. Instead of using cogs and wheels, the boom is drawn by a system of nanowires and pulleys. To further play into the sailing theme, the dial itself is made of thin strips of wood, made using a painstaking marquetry technique to replicate the appearance of a wooden deck. The Calibre UN-630 is built by Christophe Claret and finished to a superlative level with plenty of inward and outward angles on the edges. At CHF280,000, the watch is as pricey as it is awe-inspiring, though it is limited to only 18 pieces. 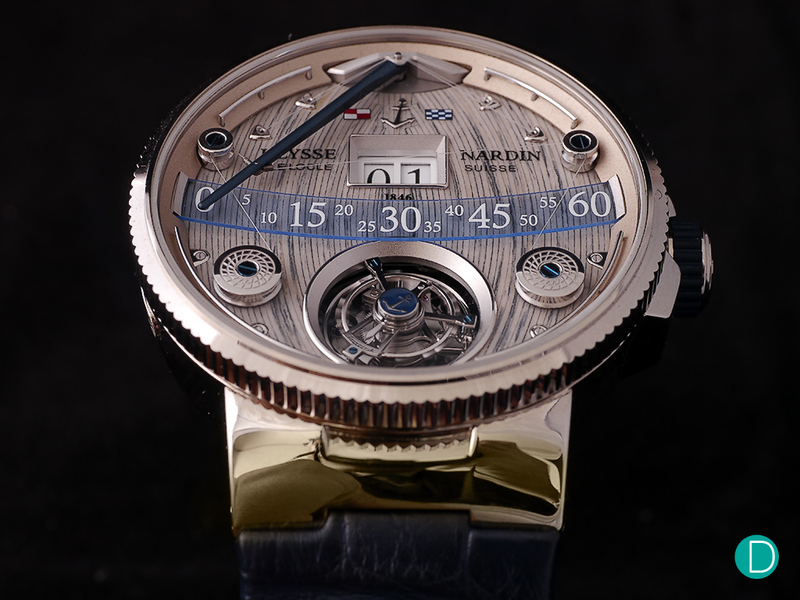 The Grand Deck Marine Tourbillon, with its one-of-a-kind aesthetics and playful retrograde minute display remains one of the most special timepieces by Ulysse Nardin. With the Villeret Tourbillon Volant Heuere Sautante Minute Rétrograde, nothing is pedestrian. From the mysterious tourbillon, to the jump hour, to the retrograde minute, the watch is a playground for the watch enthusiast’s inner geek. You may have to part with a fair bit of the contents of your coffers to obtain it, but rest assured it is packed with horological goodies. 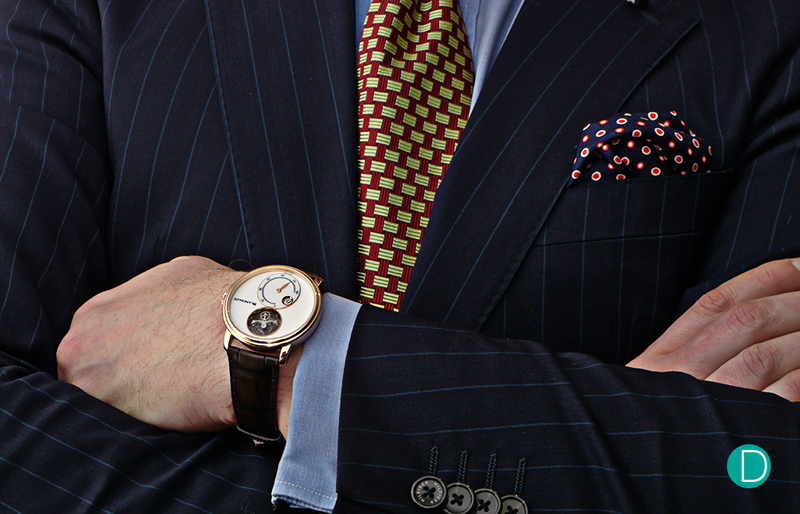 To summarise the new Villeret Tourbillon in two words? Thoroughly enjoyable.